2011: Will Buhari- Atiku Alliance Make Any Difference? General Muhammadu Buhari and Alhaji Atiku Abubakar , according to recent media reports are seeking for alliance to "salvage" the chance given to Northern Nigeria at the presidency through zoning which they feel is currently being “ wasted”. Though they had once attempted to work together during the 2007 elections, but due to their personal presidential ambitions the alliance did not succeed and they parted ways. But will the duo this time around be able to work together to send the PDP-led government packing in 2011? Situations and circumstances have been changing between the 2003, 2007 and the coming 2011 elections. During the 2003 elections, General Buhari had the advantage of massive support from the Northern part of the country and those politicians that fell out with former President Olusegun Obasanjo. And during the 2007 elections, the mood of most Nigerians is to see Obasanjo out of Aso Rock and to Northerners power will shift to the North. The 2011 elections will be distinct to the people of Southern part of Nigeria as it will determine which part, either South-South , South –East or South West will have the upper hand in having it's own as President of the country come 2015 elections. Many Nigerians view Buhari and Atiku as two strange bed fellows, but in politics permanent interest matters most and it will not be surprising to see them working together to oust the PDP. There a lot of hurdles to cross before the alliance becomes a reality. Capitalizing on the mood of the nation, especially the Northerners, is not just enough. Yes, Nigerians are suffering under the PDP- led government and people may now make up their minds that even the Yar'adua' – led government will make no impact on their lives. Some Nigerians even view Yar'adua's administration as motionless, dull, and uninspiring. It can only make promises and enter into agreements it cannot fulfill. The opposition capitalize on such sentiments of Nigerians to takeover reins of power from PDP especially with General Muhammadu Buhari and Alhaji Atiku Abubakar leading the opposition. If Buhari and Atiku are serious about forming a formidable alliance for 2011 elections, two factors are very important for the success of the alliance. Firstly, both General Muhammadu Buhari and Alhaji Atiku Abubakar should shelve their presidential ambitions aside. They should play the role of king makers through fielding and supporting a competent, vibrant and resourceful presidential candidate. Secondly, their presidential aspirant should have a running mate from the South-West. Both Buhari and Atiku had already run with Vice Presidents from the South-East and it has not translated into getting more votes from the zone or their were votes, but they were not protected. The South-South is presently enjoying the office of the Vice President courtesy of Dr. Jonathan Goodluck and with him the zone has had an edge over other zones of the Southern part of Nigeria to occupy the presidency come 2015. With a very popular and accepted Vice presidential aspirant from the South-West , such as former Governor Bola Tinubu or Governor Babatunde Fashola both of Lagos state or any other, Buhari-Atiku alliance can be guaranteed of a block vote from the zone , such votes shall surely be protected. The duo of General Muhammadu Buhari and Alhaji Atiku Abubakar for the success of their alliance must not give Nigerians the expression that they are desperate for power. General Muhammadu Buhari has contested for Nigeria's presidency twice, and in both occasions, it was the Supreme Court that legitimized the PDP –led government. Buhari has done more than enough in strengthening our democracy. If he had not contested in the 2003 and 2007 elections, former President Olusegun Obasanjo would have bastardised our democracy more than it has been abused. Buhari still remains the only politician in present day Nigeria with the largest support of the masses. On the part of Alhaji Atiku Abubakar after being a handbag of former President Olusegun Obasanjo for most of their first term, when he saw his boss planning to perpetuate himself in power, he stood on the side of patriotic Nigerians to fight against Third Term. Many Nigerians like myself will wonder what would have happed if Atiku did'nt lead the fight against tenure elongation gambit of Obasanjo. The PDP is calculative, deadly and ruthless in achieving its agenda of ruling Nigeria for sixty years. That's was why they never allowed Buhari's ANPP to win Katsina state in both 2003 and 2007 elections, thereby denying him a political base of his own. Kano state, which is the hub of Buhari's supporters, is being hijacked by Governor Ibrahim Shekarau to contest against the former or his intrest in 2011 elections. Atiku Abubakar's AC also met the fate of denying it Adamawa state as a base to its presidential aspirant. They also made sure that some of his allies in the AC dump him for PDP. Atiku himself didn't help matters by visiting Obasanjo to beg him to return to PDP as latter has been saying. With the 2011 elections as a Northern affair, the PDP is hovering over the Northern states to consolidate their grip on power. The party has been receiving decampees all over the Northern states to boost the morale President Umaru Musa Yar'adua if he is contesting for a second term. The President has allocated so many strategic positions to Northerners and his ability to handle present various workers' demand can be to his advantage. 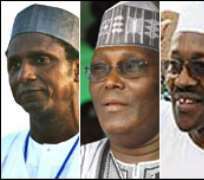 Key players of 2011 elections are Northerners, therefore from all indications; the votes from the Southern states will determine the inner of 2011 elections. With the whole world watching the 2011 elections, the hands of President Yar'adua, the PDP and INEC will be tied in case they will try something funny. It is an advantage to the Buhari-Atiku alliance to exploit this opportunity to the core and Nigerians will hope that if they win the 2011 elections they will not become another PDP. Buhari-Atiku alliance should brace up for the gigantic work of unsitting a sitting President seeking for a second term. It rarely happens, but it has happed here and there. Even the celebrated Ghana elections were so because John Kuffour was not seeking for another term. The alliance of Buhari-Atiku can translate into success if and only if each of them keeps his ambition aside.